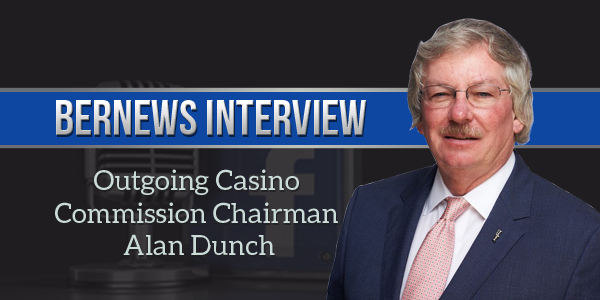 Outgoing Bermuda Casino Commission Chairperson Alan Dunch sat down with Bernews this morning [Nov 23] for a live interview, speaking with veteran journalist Jeremy Deacon. “It is my sincere hope that in making this decision to resign, you and the Government might now consider it un-necessary to move forward with the proposed amendments and, in the best interests of Bermuda, choose instead to withdraw the Amendment Act which, as stated above, is ill advised,” he said in his resignation letter. Update 11.40am: The interview has concluded, the live video replay is below, and we will transcribe some of Mr Dunch’s remarks and add text extracts later on today. When you listen to this and read the front page it really isn’t too difficult to get at least a general idea of what was and is transpiring with respect to the actions and objectives of certain past and present politicians. It seems to me that this government is trying to fix things that aren’t broken for some reason they are bent on getting control of the commission. If they want to exert some real energy they should fix the schools and busses. Very strange this new government not exactly what the people voted for. Actually, I think this government is trying to make sure that gambling does NOT come to Bermuda but they are doing it obliquely rather than directly in order to avoid claims by those who have invested in gaming in Bermuda. That would require deep thinking on their part….not ruling it out though. It seems the former government created the block on gaming coming to Bermuda. Avenues are being created to bring gaming here but I can not and will not say I like them for the long term well being of Bermuda. There are Way too many obstacles to overcome doing things the same old way. I truly feel this is another waste of tax payer dollars. This interview definitely exposed a lot and it is sad Mr. Dunch stepped down.